The Jewish Advocate wrote today about the Hebrew Barack Obama pin (left). We found the same image on a sticker on Obama’s website. According the Advocate article (linked to above), McCain does not have any Hebrew gear yet. 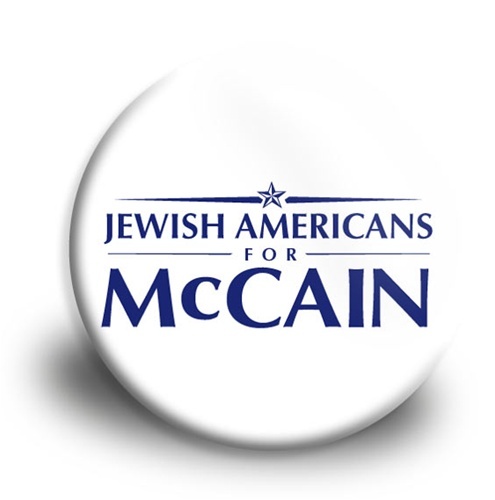 He does have a button on his website that says, “Jewish Americans for McCain,” though (right). Both candidates’ Jewish gear matches their respective campaign designs, but McCain’s, with the horizontal stripe and plain white background, almost approximates the Israeli flag itself. Hebrew phonetic print is not a new phenomenon by any means. Just about every sports team or university has their own version.